Please note folks: the PRO and MOBI products have downloadable software development tools included (with no expiry date). The INTRO and NOVICE products do not have downloadable development tools. Do you want to learn how to code, but are intimidated by the complex landscape of languages and options available to you? Or have you tried to learn some of these languages and just given up entirely? 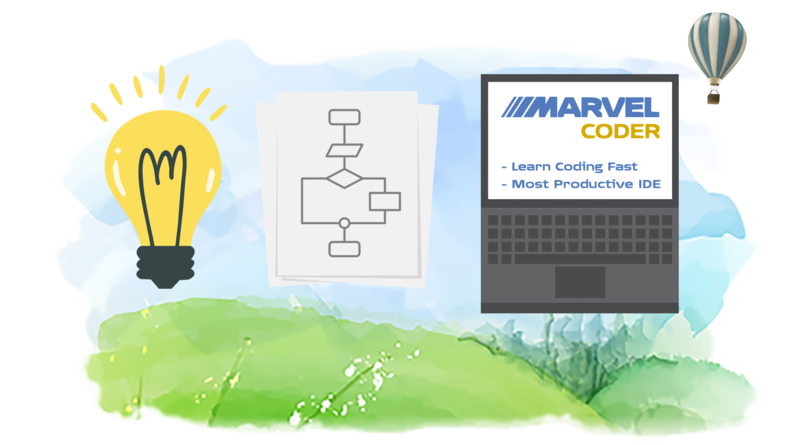 Time to start anew with today’s discount promotion, MarvelCoder — Learn Coding Fast! MarvelCoder — Learn Coding Fast is the better way to learn how to code, using the most productive and intuitive programming language ever. MarvelCoder’s training and tools teach the most-loved, high-level language for app development: Smalltalk (according to StackOverflow’s Developer Survey of 64,000 programmers). MarvelCoder — Learn Coding Fast offers you on-line training in Smalltalk which will build your abilities to use the language for coding client-side behavior and user-interface layouts, for server-side development, for database access, and for interaction with external systems such as social media. Smalltalk enables you to write code once, then deploy for access by users having Windows, Linux, Mac, iOS and Android based devices, all within a single IDE. 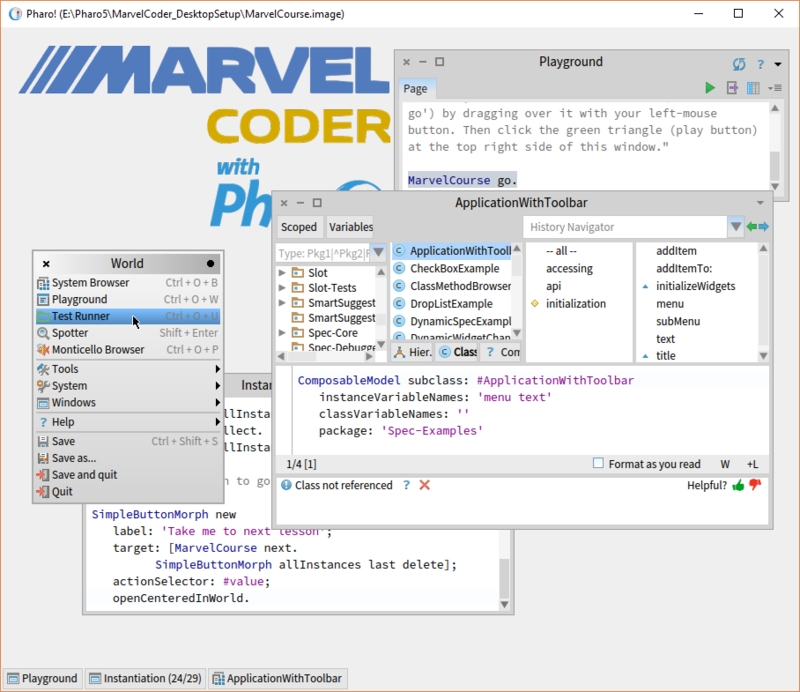 MarvelCoder provides a Smalltalk IDE for your use on Windows and Mac. With only six reserved keywords, Smalltalk is much easier to learn than any other programming language, achieving proficiency in days instead of weeks. 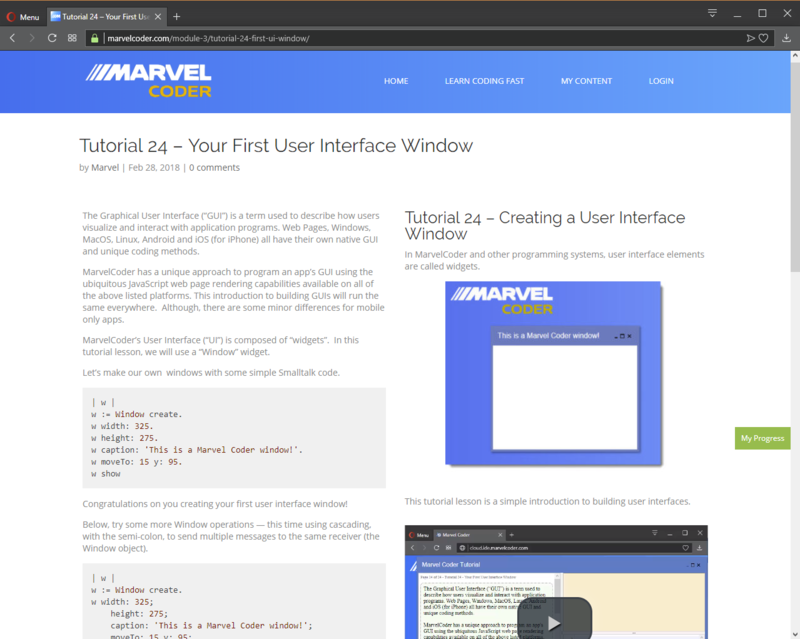 So get on your way to becoming a software developer today, with MarvelCoder — Learn Coding Fast! 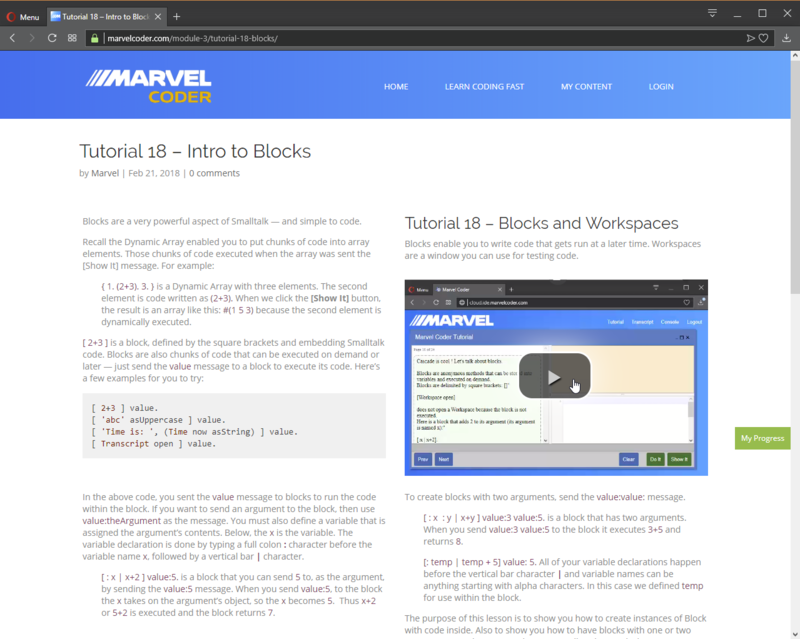 - After you purchase MarvelCoder — Learn Coding Fast the (a) online courses, and (b) Desktop IDE may be used indefinitely. - Support is provided for current subscriptions for 120 days, depending on which component you require assistance with. Support is limited to download of updated versions of the Desktop IDE and resolving any issues with your online access, if required. Support does not include answering programming questions. Optionally, we can provide custom programming services or consulting on a fee per hour, or fee per job basis. After you purchase MarvelCoder — Learn Coding Fast it may be used indefinitely. 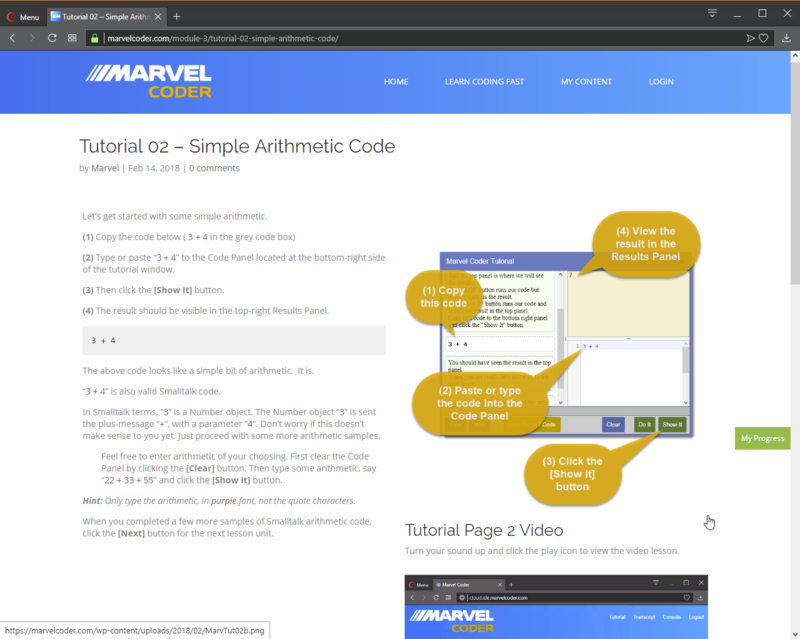 MarvelCoder — Learn Coding Fast is licensed per user, so if more people are going to use MarvelCoder — Learn Coding Fast you will need to purchase additional copies. Each license allows installation on 5 computers, but MarvelCoder — Learn Coding Fast may not be used at exactly the same time on each of them. E User This one can be a little tricky to get but I got it to work. Petr Hi E User, When you click on the [GET IT FOR FREE] button here on BitsDuJour you will see there are four products to choose from. Pick any one, as it takes you to the same page on our website. There, you can read about the four options. 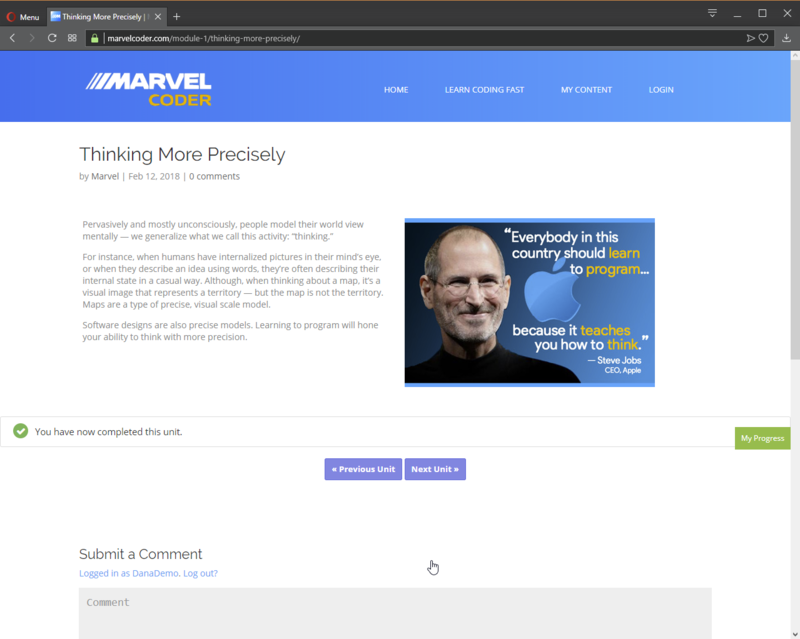 The FREE MarvelCoder product is available there. Also, big discounts on the others (for a limited time). E User I got it figured out. Thank you for your assistance, Petr. When we clip on the Pro promotion, on the page for filling the first info to create an account it said 1 year access instead of 2 and it only said course 1 instead of 1 and 2. ????? Petr Hi Denis, Thank you for reporting this. Will update the message text. Also, I checked to ensure your PRO purchase is as expected. All is good with your purchase. (Remove the spaces in the email. Spaces added to twart bots that harvest emails from web pages). Nico Westerdale Great News! MarvelCoder.com has agreed to extend this deal for another day - Enjoy! Justin I purchased this here just over a month ago, now already v2 released. Please advise if I'll be able to access this new version? Petr Hi Justin, The online courses have been incrementally updated with minor improvements. We are releasing significant updates to the PRO web app courses by end of next week. Also, a new Desktop IDE version will be released then, for PRO and MOBI customers. All existing customers will have access to new course content and downloads of the development tools. We will send an email to all customers announcing the new content and downloads. Pixel Grinch Ummm how do you change my password? I don't see any way to change the password in the Wordpress Page Dashboard that you are using. It looks like you are sending the same password for every new account, not very secure! I was wondering why I can't find anything about MarvelCoder on google. Petr Hi Pixel Grinch, To change your password, click on the "Forgot password?" link in the login page. Enter your registration email and submit. You will receive an email link in your inbox to enable setting your own password. There is no sensitive information in your account, no financial info and it would be hard for someone to guess your email. But, I agree and we will increase our security. For any further assistance or support, please send me a private email to: admin @ marvelcoder.com (Remove spaces in the email address. Spaces added to twart email harvesting bots). We have not done any specific SEO to increase our Google presence. 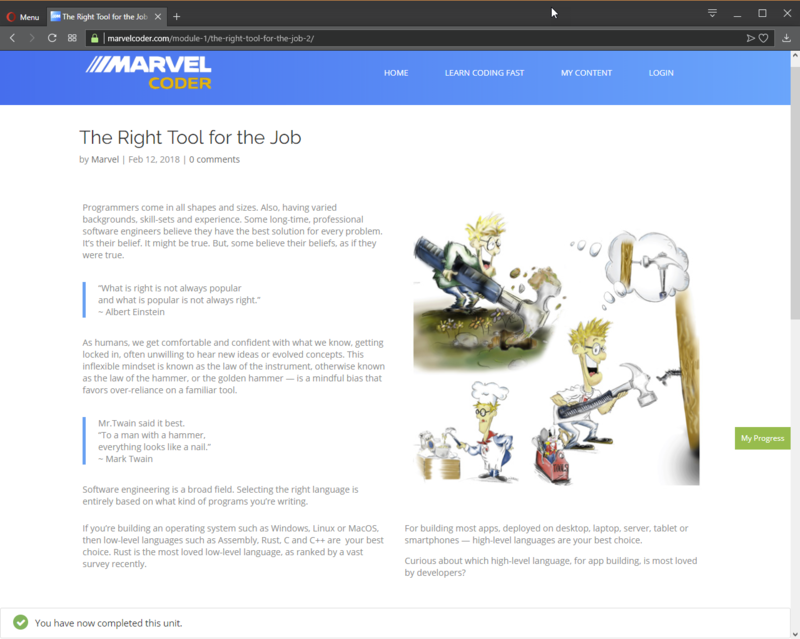 However, when I Google MarvelCoder I do get results, images and some of our posts showning up. Can you tell me if all the courses use Smalltalk exclusively? peter anon I really seem to be missing a HELLO WORLD example to know if this language is something I can relate to. For some reason I';m not seeing a single example or lesson I can access on your website? IMHO that's not the way you attract people to adopt a new language. So yes, our courses and tools focus on Smalltalk, but it's a way to learn only one language to build web apps and mobile apps. Smalltalk is the most productive and easiest to learn language. Novices learn quickly. Professionals become more productive with Smalltalk. And, what you learn with Smalltalk will carry over into your use of other languages, when you eventually expand your repertoire. #1. Code: Transcript open; show: 'Hello World'. Can it do any graphic animation or blitting, to make even a simple game out of it? I presume collision detection is beyond its reach? For Desktop Apps, just use Smalltalk. About your graphic animation question, I'll update this response shortly. And can it do sound and video playback at all? Like youtube embed, or html5? Also hoping it has, or will have, html5 canvas support? Petr Hi Peter, MarvelCoder uses a modified, open source IDE called Pharo. For Desktop Games: Code directly in Smalltalk. There's support for sound, animation, graphics.. with very little code required. And 3D game style graphics: https://www.youtube.com/w...Nze9tnwYxY (experimental code scripting a game engine). Here you can see the power of Live Coding, making code changes while the game/graphic program is running. There is sound support. Our PRO course has a unit with some sample sound generation code. The Youtube videos show what's possible, but do not reflect our more basic course content. Beyond simple web apps, if you want to do your own HTML5, Youtube embedding... you'll have to do some manual client-side coding that's not within the scope of our courses. But, the IDE enables you to do these things. Embedding Youtube videos is pretty easy, for instance. Thank you for your earlier reply. You describe Pharo as an IDE or development environment, but I've been reading that it's actually a dialect of Smalltalk. For example, Wikipedia says, " Pharo Smalltalk is a fork of Squeak oriented toward research and use in commercial environments," and "Squeak is an open source implementation derived from Smalltalk-80 Version 1 by way of Apple Smalltalk." In other words, Squeak is a version or dialect of Smalltalk, and Pharo is a version of Smalltalk -- and it's oriented toward commercial environments. Petr Hi Warren, Smalltalk was invented by Xerox. Early in the 80's Steve Jobs visited Xerox Palo Alto and saw a computer with the first Windowing user interface and a mouse — he discovered Smalltalk. Jobs got the idea for the Apple Lisa and Mac from Smalltalk. Later, Apple had their own Smalltalk. When Jobs returned to Apple, the first iPhones and Macs at that time were programmed using Objective-C, a language using Smalltalk syntax but not as powerful or easy-to-use as Smalltalk. Objective-C is still used today by Apple. In the 90's, IBM and other companies sold Smalltalk IDEs and it was the fastest growing language. In the early 2000's, the U.S. joint military used Smalltalk to write a million-line battle simulation program called JWARS. It outperformed a similar simulation called STORM written in C++ by the U.S. Air Force. Big banks, Wall Street firms and others still use Smalltalk today. My own eCommerce hosting company's systems are built with IBM Smalltalk. Today, Pharo Smalltalk is the most modern Smalltalk and very actively developed. In a recent 2017 Stack Overflow Survey of 60,000 developers, Smalltalk was voted the "Most Loved High-Level Language". Jake User Are you using Pharo 7.0 as a base? It just came out a few days ago. Petr HI Jake User, At this moment, I'm working on a major upgrade of the PRO Course 2, using the new Pharo 7 that just came out a few days ago. All PRO and MOBI members will get the upgraded IDE in the next 5 to 10 days. The INTRO and NOVICE Courses only use the Cloud IDE. The MarvelCoder IDE is based on a modified open-source Pharo Smalltalk IDE. It has built-in course lessons, example code and is synchronized with the online CourseWare units and video tutorials. I'm very keen to get this upgrade to you guys.